How to do a Glitter Tattoo? Before applying a glitter tattoo, the skin area must be cleaned thoroughly using something like surgical spirit. The stencils are three layer so gently remove the white backing paper, then place the black sticky section and top clear cover onto the skin, smooth over so it sits flat to the skin. Once flat, remove the clear top layer so your only left with the black section. Using your cosmetic body glue, remove excess off sponge or brush and then lightly cover the skin area of the stencil, making sure all edges are covered, work from the outside in. The glue will go on white but when turn clear. Once clear you can apply your cosmetic glitter. Remove any excess glitter with a big duster style brush. Carefully remove the stencil from the skin and you will reveal your beautiful glittery tattoo. 1. My glitter tattoo is patchy? You need to apply more glitter. 2. When I remove the glitter tattoo stencil, glue and glitter comes away with it? You have used too much body glue, remove excess glue before applying to the skin. 3. The stencil will not stick to the skin? The skin is too oily, ie sunlotion, this needs to be cleaned beforehand using surgical spirit and allowed to evaporate before placing the stencil on the skin. The stencils are ONE use only! 4. Why are our brushes clogged with glitter and glue? 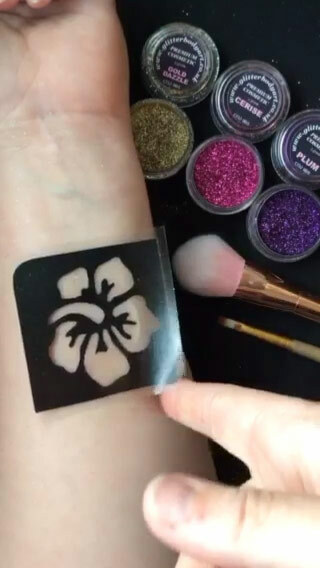 Your brushes are not loaded with enough glitter, they should be used like a spoon effect so tip the glitter onto the stencil and then pat down with the flat edge. 5. How to do clean my brushes which are clogged with glitter and glue? Soak them with surgical spirit and it should remove and excess. 6. My glue has gone too thick? You can add a couple of very small drops of water to the glue and this will water it down.